Sunscreen and Sunglasses for Dogs! As the weather turns nicer there are a few things to remember for your dogs. Yes, sunscreen for the fair haired dogs with pink/white noses and sunglasses (Doggles) for the dogs who ride on the back of motorcycles or hang their heads outside of car windows. Doggles! At first when Gracie’s mom came into Barkz the dog stop in Kirkland 5 years ago, Gracie was one. 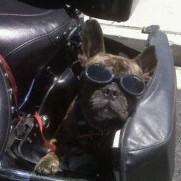 Gracie’s owner asked “Do you have any sunglasses for my French Bulldog who rides on the back of a motorcycle?” At first I was stunned because I hadn’t seen a dog strapped to the back of a motorcycle before (there are seats for dogs) and second I hadn’t heard of sunglasses for dogs. 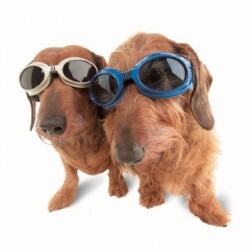 Sure enough – Doggles had arrived. The photo at the top of this blog is of bulldog sporting Doggles Dog Goggles ILS With Skull Crossbones/ Smoke Lens – Small . If you visit Doggles you will find a variety of colors, sizes and styles. All of the lenses have 100% UV protection, with shatterproof lenses and there are numerous frames that will suit your dogs style and size. After this exchange – more and more dog owners asked me for sunglasses. I sold a small pair to a dachshund who, when the sun appeared in Seattle wouldn’t go outside. We fitted him with some Doggles and he strutted out of the store cool as a cucumber. For dogs who love the wind in their face – hanging out a boat, or truck window – Doggles are perfect. As an owner of a lab who loves the wind in her face, loves the feeling of her lips and her ears flapping in the wind – I had to stop and think of all the debris that flies by that could get into her eyes. Many a time vets see foreign objects in dogs eyes that could have been prevented if the dog was wearing sunglasses. I will also mention a portable water bowl that I travel with at all times for Reef. It’s called the Gulpy. It comes in two sizes (small and large) and loads of colors. It fits in your backpack for hikes, walks, extended swims and long drives. Note: don’t leave your pet in the car on a warm or hot day and if you take your dog to the park with your kids be sure to place your dog in the shade. Perfect! I was just about to start looking for a portable water bottle for when we take Gunnar to Marymoor. 1 Gulpy purchased, thanks for linking it straight through to Amazon for me, it’ll be here by Friday.